Bobit Business Media's COO Cyndy Drummey took this photo at Logan Airport's consolidated car rental facility on June 29. Photo by Cyndy Drummey. During the upcoming Independence Day holiday weekend, AAA projects nearly 43 million Americans will travel, according to the “AAA Independence Day Travel Forecast,” an increase of 1.3% from the 42.3 million people who traveled last year. 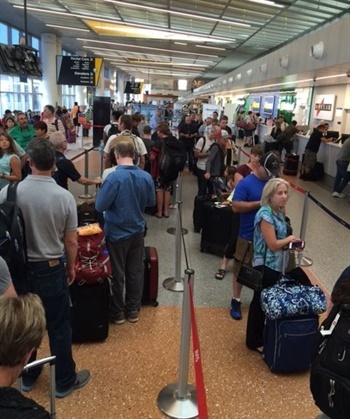 This represents the highest Fourth of July travel volume on record, according to AAA Travel. This number is up five million more travelers compared to Memorial Day weekend 2016. More than 36 million people — 84% of travelers — will drive to their destinations, an increase of 1.2% over last year, according to AAA Travel. The Independence Day holiday travel period is defined as Thursday June 30 to Monday July 4. Despite recent seasonal increases, gasoline prices remain well below recent years. In fact, AAA expects most U.S. drivers will pay the lowest Independence Day gas prices since 2005. The national average price for a gallon of gasoline is $2.31, which is 47 cents less than one year ago. When it comes to car rental, daily rental rates will average $75, 6% more than last year, according to AAA Travel.